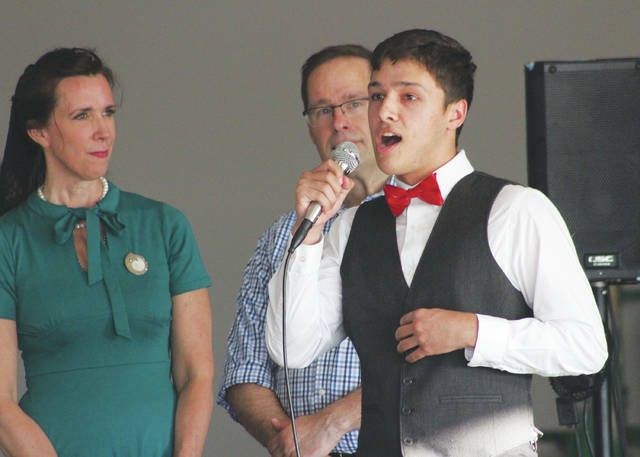 Christian Velez-Brown (front), a cancer survivor and recent Olentangy graduate, speaks during Saturday’s Hangin’ with the Stars at Delaware City airport’s Jetstream Center. The event, coordinated by Janis Mitchell (left) as part of her work with Make-A-Wish, was a fundraiser to help make Velez-Brown’s wish come true. Doug Kelly, President and CEO of the Ohio, Kentucky and Indiana Make-A-Wish Chapter also looks on. Christian Velez-Brown was taken aback by his surroundings before Saturday night’s fundraiser inside the Jetstream Corporate Center at the Delaware Municipal Airport. He wasn’t sure what he had done to deserve a 1940s swing dance-themed benefit in his honor held inside an airplane hangar. Velez-Brown was diagnosed with stage III right testicular cancer a little over two years ago. Thankfully – after surgery and four rounds of chemotherapy – he’s in remission. And that was part of the reason why he felt like he didn’t deserve a wish. So, his first wish was to pass the wish to someone a little more deserving. But, he was told he wasn’t allowed to do that. The thing is Velez-Brown is deserving. At a time when most high school students are worrying about getting into college or hanging out with friends – Velez-Brown was cooped up in his house because the cancer treatments made it difficult to endure the elements of the outside world. And nobody deserves that. Velez-Brown was the guest of honor Saturday night for the Hangin’ with the Stars fundraiser organized by Janis Mitchell through the Make-A-Wish Foundation’s Women Inspiring Strength and Hope program to help Velez-Brown have his wish of meeting a NFL quarterback granted. The goal of the event – which had a 1940s era swing dance theme – was to raise the cost of the wish. The average wish costs $8,000 to $10,000, but it’s expected that it will cost more than the average. “I’m pretty confident that we’ll get there,” Mitchell said. Velez-Brown started experiencing headaches in the spring of 2016 and some were severe enough to force him out of school. Still, he didn’t think anything was wrong. In August of that same year, he was horse-playing with his brother and got hit in the groin. When the swelling didn’t subside over the next couple of days, he went to see his pediatrician and was rushed into surgery that night, and that’s when they found the cancer. “The five stages of grief – I went through them all in about five minutes,” he recalled when first hearing the diagnosis. Velez-Brown missed the first semester of his junior year and still managed to graduate on time this spring from Olentangy High School. Christine Hoyer, a development officer with Make-A-Wish, felt the fundraising event was extremely important. “We’re changing the outcomes of these kids’ lives,” she said. “We are giving them purpose at a time when they’re fighting for their lives. “We have 780 kids in our pipeline. We have so many kids that we want to pair them with people that are out there in their communities,” Hoyer added.